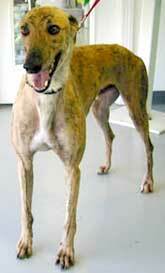 Vance is a handsome 3-year-old brindle male, born March 2001. His litter registration number is illegible, so his history will remain a mystery. Vance comes from the Paris, TX shelter where he was brought in as a stray. He was named after one of the caring shelter volunteers who brought him to GALT. Vance is a non-demanding boy, who is just happy to be in the company of humans. He gets along well with other greyhounds and dogs. Vance is small animal and cat tolerant. Vance is a sweet, laid-back boy. He was SO well-mannered when he visited for cat-testing that he got to stay on another night. He ignored the cats for the duration of his stay. His natural, initial curiosity about them was over in five minutes. He got along very well with the other greyhound and a terrier mix in the house. Vance seems to enjoy car travel. He readily jumps into the back of an SUV or a back seat. He mostly likes to be wherever his human happens to be. When my dogs went off to bed without me one night, Vance was snoozing on the dog bed in my office while I finished my work. He deserves to find a loving forever home soon.